People living in alpine and Arctic areas have long needed to travel in deep snow, so they invented various forms of equipment that permitted them to glide or walk without sinking into the snowpack. Many of the winter sports people enjoy now, such as snowshoeing and skiing, originated from these practical inventions. 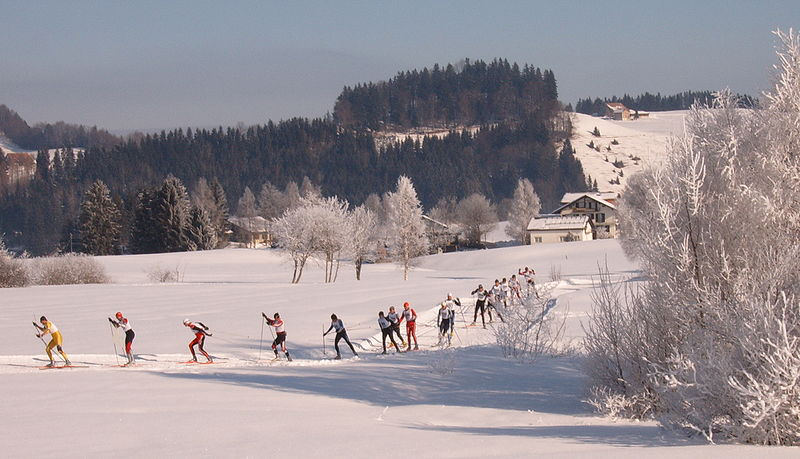 These cross country skiers in Einsiedeln, Switzerland, use skating and running motions to help them glide over snowy terrain. Snowshoes distribute a person's weight, preventing the wearer from sinking into the snow. Teardrop-shaped snowshoes, seen on the left, are broad in the front and taper to the back. Bearpaw-shaped shoes, on the right, are curved on all sides and lack the tapered tail of the teardrop shape. Snowmobiles are equipped with treads and skis, which are more effective in deep snow than wheels are. Snowmobiling is a popular wintertime activity, but in very snowy areas, snowmobiles are sometimes the only way to travel. 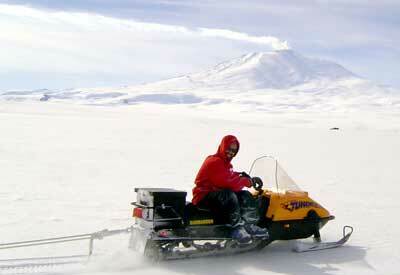 This scientist is using a snowmobile to haul equipment while conducting research in Antarctica near Mt. Erebus, visible in the background. Skis originated as a way to distribute a person's weight over a greater surface area. Originally, skis were long, narrow, wooden slats that people bound to their feet. Modern skis may contain wood cores, but are usually made of variety of materials, including fiberglass and Kevlar. Most types of skiing also use poles. Alpine, or downhill, skiing involves gliding down a slope. Most alpine skiing takes place at mountain resorts with groomed slopes and towlines or lifts to transport skiers to the top of the ski trails. Alpine skis require bindings that keep the skis attached at both the heel and toe of ski boots. Alpine skiers generally keep their skis parallel as they travel down a slope. Cross country, or Nordic style, skiing doesn't require groomed slopes or resorts, and can be done anywhere, as long as there is enough snow. Cross-country skiers generally use a combination of walking, running, and skating motions to propel themselves across the snow. For cross-country skiing, boots are generally connected only at the toe to allow more flexibility. Telemark skiing is a form of downhill skiing, but uses a binding style that attaches only at the toe, which allows skiers to kneel, stagger their skis, and make smoother turns as they travel back and forth down a slope. Skiers have created their own terminology to describe types of snow, including the terms fluffy snow, powder snow, and sticky snow. The terminology has expanded to include descriptive terms such as champagne powder, corduroy, and mashed potatoes. Snowshoes make traveling over deep snow easier. Snowshoes consist of a hard oblong frame laced with webbing that is designed to distribute weight so that people can walk on top of the snow surface without sinking through. 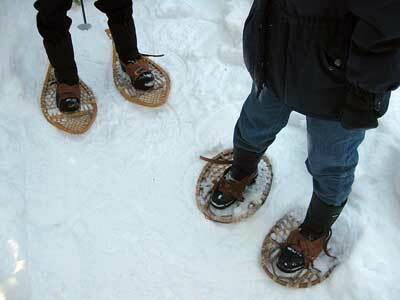 Traditional snowshoes were made of wood with hide webbing, but modern styles employ metal and plastic. People who live in snowy areas still often use snowshoes, and they are still necessary equipment for forest rangers and others who work in areas that are otherwise inaccessible by vehicles or snowmobiles. Snowshoes also remain popular among recreationalists who like to hike or run in areas with deep snow. Snowmobiles are motorized vehicles specially adapted for traveling over deep snow. Most snowmobiles are propelled by a motorized rear tread, and the driver controls a pair of front skis to steer and maneuver. Although snowmobiles are often necessary to conduct research or rescue operations in snowy areas, many people like to ride snowmobiles recreationally. In addition, many Indigenous residents and hunters now use snowmobiles as their primary form of transportation across snow and sea ice.